Mt.Takigo Trekking (滝子山トレッキング) is popular spot for hikers because of great accessibility from Tokyo Metro. Mt. Takigo is 1,610m tall mountain located Otsuki, Yamanashi prefecture. It is about 6 hours of trekking, and on the top of Mt. Takigo, it has a great view of Mt. Fuji. This view of Mt. 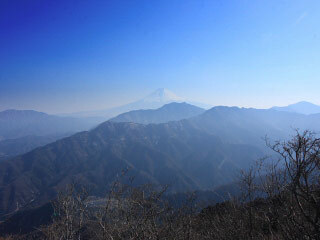 Fuji is chosen as one of 12 best view points of Mt. Fuji. No car, No bus required. Only train. 1. use JR Chuo Line to Sasago or Hatsugari. 2. climb up 3 hr. The trekking route starts from Sasago station. Walk east the north for 1 hr. to reach the entrance of Mt. Takigo. Walk through Sumi valley that has many beautiful waterfalls. Top of Mt. Takigo. It is 1,610m tall. The view of Mt. Fuji is chosen as one of 12 best view points of Mt. Fuji. -Hinoki Daira- Another view point of Mt. Fuji.